Having so many school supplies around my apartment is forcing me to be more creative with my organizing. While shopping online for some new desk things (and looking for more ideas on the best way to organize a TON of stuff in a TINY space) I started searching for a cute tape dispenser. 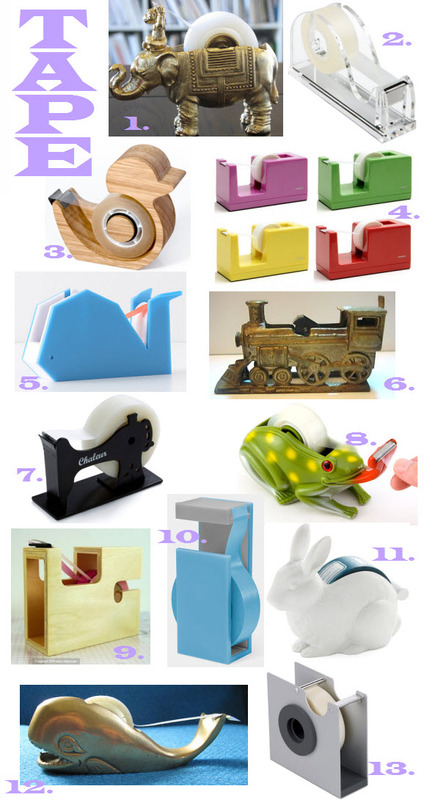 Do you have a fun tape dispenser at home? Love your impulse to organize! Way to be! and love these dispensers, who knew there were so many out there?! I continue to be madly in love with the iomoi dispenser. We haven't ever purchased a desk for our home office yet and I'm already solely focused on the accessories. Typical. poppin gave me a white one and i love it but that iomoi one is sooooooooo cute! Okay you have convinced me that I MUST get a new one. That whale? Too cool for school! Have a great weekend Linds! Such a fab round up. Too bad I have hide my tape from the kids. I totally want a cute dispenser sitting on my desk.